Abacus Accounts is a double-entry bookkeeping application, suitable for any business or company accounts. It is powerful, but easy to use. Various types of accounts can be set up, to suit your business. It can be used by VAT registered or non-registered businesses. Please note that it does not currently have the option to connect to HMRC, as required by UK MTD VAT. However, it does allow for the exporting of VAT Return data, which can then be uploaded to HMRC using a 'bridging' application. Selections are made using clearly labelled buttons or menu options, whilst transaction entries are made through popup panels, which present the user with the required data fields. It supports accounts for up to 10 companies/businesses, simultaneously. You can also set up regular (monthly, quarterly, yearly etc.) payments/deposits from any bank account.You are also able to create and print (or email) customer invoices, using your own logo as a header. The essential bookkeeping requirements are covered, such as viewing account registers, reconciling bank accounts, tracking customer/supplier balances, VAT (or GST, HST etc. ), if required, and end of year reports (see below). Should you have specific requirements or questions, please contact us, using the link below. The program is flexible enough to be used worldwide, as VAT / GST / HST / Tax rates can be customised. However, it was designed with the aim of being very quick and easy to use. If you are running a business and want to do your own bookkeeping, this program should meet your requirements. Although it helps to have some previous bookkeeping experience, a detailed description of how to use the application is included in the help pages. Technical support is also available by email, free of charge. ★ Easy to use double-entry accounting package. ★ Supports Multiple Companies (up to 10). ★ Currency symbol, decimal point and ‘thousands’ separator are selectable to suit your country. ★ Chart of accounts defined by the user (including bank accounts, credit card accounts, asset, liability, equity, income and expense accounts). ★ Track bank accounts, credit cards, income, expense, assets, depreciation, liabilities etc..
★ Ability to delete (void) or edit transactions. ★ Enter customer and supplier invoices/credit notes. ★ Track customer and supplier payments/balances. ★ Protect entries using a 'Closing date'. ★ Reconcile bank accounts/credit cards. ★ Recurring Bank Payments & Deposits, with selectable frequency. ★ VAT / Tax calculated automatically, based on rate defined. ★ Supports VAT Flat Rate scheme. ★ Comprehensive Reports (see below). ★ Export reports to CSV files. ★ Print (or email) customer invoices/credit notes (using your own logo or headed paper). ★ Backup and Restore function. ★ Detailed Help pages (including video screencasts). To purchase, please visit the Mac App Store ‘Finance’ section. Requirements: Mac OS X 10.6 or later. 64 bit machine. In order to meet the requirements of MTD VAT, in the UK, a VAT Return export facility has been added. This allows the user to export the VAT figures to a file, which can be transmitted digitally to HMRC by a third-party 'bridging' application. One such application is MTDfVAT, by Digital Filing Solutions Ltd. The interface to this software has been tested and confirmed to work correctly. For more information on this 'bridging' application, please go to www.mtdfvat.co.uk or click the Image (to the right). A free version of Abacus Accounts is available for evaluation. It is functionally the same as the full version, but it is limited to saving a maximum of 30 transactions. Please visit the Mac App Store, ‘Finance’ section, to download the trial version (Abacus Accounts Lite). Should you decide to purchase the full version, you can transfer the accounts, customers and transactions you have created (using the backup/restore options). A simplified version of the app is also available, for small or sole trader/self-employed businesses. These apps (Abacus Accounts and Abacus Accounts SE) do not collect any personal data from the user's computer. 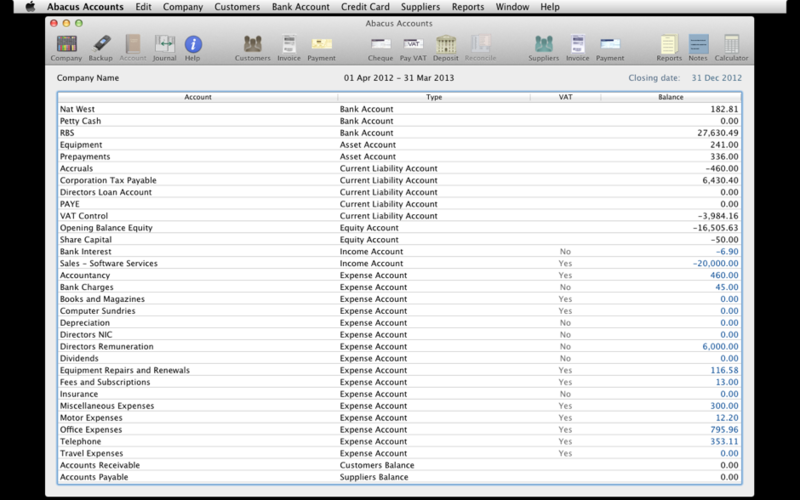 Any data entered by the user is held on the user's mac and is used only by this application. No data is transmitted to the developer or any third party. Bookkeeping data you have entered can be deleted, through the 'Admin' menu.